* Height and Weight at Time of Disappearance: 4'0"
* Distinguishing Characteristics: White female. Blonde hair; blue eyes. Thin build. Fair complexion. * Clothing: A mustard colored, crew neck jumper; faded blue jeans; black shoes with odd socks, one white and one fawn. Linda disappeared from the St. Kilda foreshore about 17.00, Saturday August 10, 1968, a week before her 8th birthday. She was playing with her siblings and some other children near the St Kilda pier, Luna Park or Little Luna Park when she disappeared. Linda has never been found and is believed to have been abducted by Derek Ernest Percy, now convicted of having killed a 12 year old girl in July, 1969, and believed to have abducted up to 8 still missing children in the 1960s. When asked about Linda Stillwell, Percy said he could not remember if he had killed her. 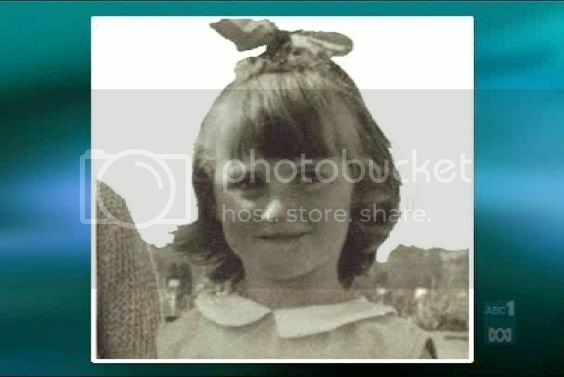 I have been asked in the requests here on blogger to look at Tarot with regard to the little missing girl Linda Stillwell. Linda disappeared many years ago but it seems answers have not arrived in finding her. I also understand that there is and have been enquiries about a jailed convict however, I am not looking into Tarot for a persecution of this man or any other. My enquiries are simply to ask what happened to this girl and where she might be found. Tarot might be able to provide some insight into this however Tarot is not 100 per cent accurate and always tends to look at past present and future matters. Please go to other sources for factual information. Asking what happened to Linda on the date she disappeared Tarot produces to me the Knight of Cups. Please remember Tarot will tell us many things and sometimes jumble its information on timing. What we have here is an 'invitation'. This invitation appears to be someone that is likeable. The scenery appears to be landscape and water (trip to lake or near water) there may be boats as a possibility someone in the vicinity. This Knight is thought of as 'going west' but he is appearing to travel towards the East. So West primarily and East comes up here and it may be names of Roads as well as direction. This is an invitation that should have been checked by a third party. Therefore being 'asked' or 'invited' to go somewhere should have been told or cleared by someone else before doing so. This Knight is very friendly. It is someone you would feel you could trust because they do not appear to be someone who you would be afraid of. However, it is a proposal and an invite to go near to the water perhaps as the Queen arrives next and she is a very watery card. I seem to hear 'music' at this point and not sure why that would be? The Ten of cups shows a 'house on the Hill' two people and two children and is often thought of as a 'family card' or the home town. The page that shows up after this seems to put forward an unexpected message possibly regarding a child and of course the Knight shows this friendly person with an invitation to the water. This of course just could describe the day for Linda. The last card is a 'fatherly figure' meaning a King who sits near the water. The king appears to be a kindly man. The knight however, is a younger man often thought to be up to the age of 35. Therefore I am feeling there is a possible male figure here that is the primary person that comes into view on this day. This Knight as all knights would be linked to a vehicle of some description. This card can describe being 'taken on a trip' but they appear to be nice and very friendly. Perhaps they said they were going to take this little girl home? The reason I say this is because the Queen and King can represent what would be a 'father and mother'. Therefore if it is an invitation or 'proposal' it appears there is a possibility that this girl was possibly offered a lift or invited to be taken home. However, it may be that this girl was taken to a place of Water or somewhere there is water either in a name or actuality? I think its possible that this is what may have occurred as the Knight always tries to 'help people out' and he may have approached Linda under that kind of principle. I also see a much younger boy there too. For some reason, or it could be Linda herself but Im seeing some kind of unexpected event or some message that was not carried out. Im seeing the knight as being kind but underneath it seems to me that he is rather manipulative. I'm rather feeling that this person may be at the bottom of Linda's disappearance. Cups are usually 'fair haired people' blondes or lighter brown hair. He would be possibly 'over interested' in Linda and likely in the wrong way as Knights of Cups are flirts and if one expanded on that it could be someone who is 'interested' in a way perhaps they should not be? the possibility is there. However they are inviting Linda to do something or saying they will 'help them out' and maybe even offer her 'a ride home' in any case that is what it is appearing to seem. We should make a note of the West signs in Tarot and 'East' also. There is also the water/lake reference and possibility even Fishing/fisherman and boats could come up on this card and worth noting. The negative sides of the Queen and the King could show 'drugging' and even 'smuggling' so either of those things could appear. Fun and Excitement seem to be within the day that Linda disappeared but I feel this may have ended badly. If there is any connection to Boats or Vehicles there may be something connected about the number 13. It could be 13 days or the 13th day. There is a kind of 'obsessive' nature on the Knight of Cups. The very negative vibes of the Queen and King could lead to drugging and in fact could lead to suffocation. Very rare would I write this but the possibilities are there in these cards but it is apparent to me that Linda was invited to go somewhere by someone who said they would 'help her'. I also feel that someone that 'gossips' possibly female is in this tarot but appears to have a kindly nature or who appears to be intuitive. I am feeling that is directly aimed at the witness who says she saw Linda and seems to corroborate a couple of things that Tarot is picking up. HOWEVER, tarot picks up EVERYTHING whether true or not and I will point this out. This girl was invited to go somewhere and she went because the person said they would help her. It seems we have not moved very far away from the cups cards. When asking where Linda is, we have WEST. Note also the King of Cups is the card that has come to tell us where this girl is. According to this card (it is a 'father figure') this child is in her own town or 'place of origin'. That is where she is. This King sits near the water. There are several words that can come up with the King of Cups and whether any will have meaning I cannot be sure but I will give them. Stone, Altar, Boat, or 'Red Ship'. This man can wear a 'ring'. He can be part of a 'ring'. He is capable of smuggling/hiding/drinking drugs/smothering/etc. He is someone who likes to be around children and enjoys being around them. He would rather 'play with children'. This man is often thought of as a batchelor, but again he can be a family man so perhaps separated? This man does not come out reversed and even though the negative traits can apply, it is not zooming in on them in Tarot, what it is giving is someone who is 'kind like a father'. Now we are asking where Linda is and I have to say that this card tells us firstly WEST and that we must look for some kind of 'church name' ? Also we have to look 'close to home' as we automatically have to look at the 10 of cups when looking at the king. So this child is 'close to home' according to the Tarot. Whether this turns out to be correct or not I cannot tell you but I give what it tells me. It tells me that it is her home town, that there is landscape, a hill and a house and a stream or brook/creek nearby. If there are any names that link to any of the above in the direction of West then perhaps that is a good place to look? I also need to mention whether anything is known of Lindas natural father? did the father have a particular feeling for Linda and want to spoil her or want to be part of her life, were the parents seperated? I do not know the full story and may have to look this up. I see with all the positive cards and non negative cards that even though there are very bad connections on the reversed cards which I have pointed out, it is pointing to connections with family as a possibility therefore that must not be ruled out. Of course we must look at both sides of what Tarot is telling us and I cannot be the judge here to decide only offer what there is. Other connections could be a 'fathers business'. Asking when Linda will be found, all I am being offered is a TEN. This ten comes by way of the wheel of fortune and this is often linked to fate and karma and could even promise success. The only thing of course is what is meant by the TEN. This card is linked to Travel. It may mean that she is at a TEN distance or that 10 might be a year such as 2010 BUT of course that was last year and I assume she is still missing since I have been asked to enquire about her. Was there anything significant in 2010 that might be brought forward? Or perhaps Tarot is suggesting TEN in some other ways. Maybe it is TEN from the date of this reading. This is something I cannot really be sure of. However, the next card is the Justice card which is the LAW/LEGAL matters and Court. Therefore perhaps a court matter might produce some results at some point? The 9 in the major arcana often shows an old man (sometimes with grey hair and beard )looking over the Hill and clearly it is thought that he is the one that can provide the light. He has the lantern. What kind of surrounding would he be connected to? Well it would be someone that was fairly isolated, sometimes rustic/rural like camping trailers/ places that are slightly off the beaten track, but also can show us places that are high up like apartment blocks. It is very dependable Im afraid and can represent both things. The Hermit also looks West and I do feel that West could be the direction, or it could be the name of a route or road or place with WEST as a significant word. I am not sure whether this Tarot will help or not but I have tried to produce all the information I can and hope that it will provide some help. I cannot decide on who may be responsible in relation to Linda except for the people I have described and the possibilities there. It seems that Linda could be connected to her home town though and one hopes that might be the case as it could narrow things down if searching. The King is also a number 14 card. She could be 10 -14 miles West from home? However, I want to point out that West and East and a church name seem to be strong and the 10/14 may mean something else figuratively altogether and not be a distance. Perhaps something happened in 2010 and 2014 may be the time she could be found? These are all possibilities. Linda could have been West but moved East and bear in mind the Wheel of Fortune is TRAVEL - or a Trip? The King of cups can often refer to summer and a time period between June 22-July 22 though this is not always reliable and it only gives those months. Perhaps it has some significance? The Wheel of Fortune is rather a good card for suggesting a person could be found, but it does tell us that we already have part of the journey therefore I am feeling that something may be able to be unravelled in order to find Linda eventually. It would be a wonderful thing if this would be the case. I cannot guarantee all I have been given by Tarot and sometimes the information can be a little jumbled but I hope there is something here that might help or assist.